Add a passenger backrest and pad to your VStar 650. Shown here is a 2009 V-Star 650 Silverado with a short passenger backrest upright or sissy bar and studded cushioned passenger pad. Passenger Backrest Side Arms are required to attach the upright passenger backrest to the bike. A taller upright is also available. 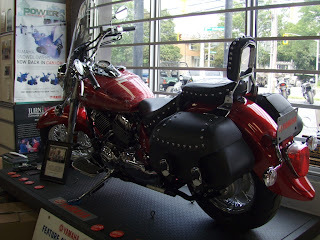 A rear luggage rack can be added to the passenger backrest.